Die Martis, videlicet, 24 die Maii. Beauvois, Chaplain to the Earl of Dorset, Privilege. Earls of Bedford and Portland. Ld. Privy Seal to be Steward. Message to the H. C. that the Lords are ready to proceed in the Trial. The Charge against Justice Berkley opened. Sir Edward Cooke in Com. 18 E. III. Weyland's Case. Justice Berkley desires Warrants for his Witnesses. Further Proceeding in his Cause. Message from the H. C. for a Conference about the Adjournment of the next Term. For the Lords to sit To-morrow. And for Men to be raised for Ireland. 1000 l. to be paid to Captain Armstrong. Lord Pagett mustering the Trained Bands of Bucks. Message from the H. C. with an Ordinance to be sent to the Committee at York. Commissioners to be sent to Lincolnshire and Hull. And for a Conference, about the Safety of the Kingdom. Babb and Trelawny in Error. 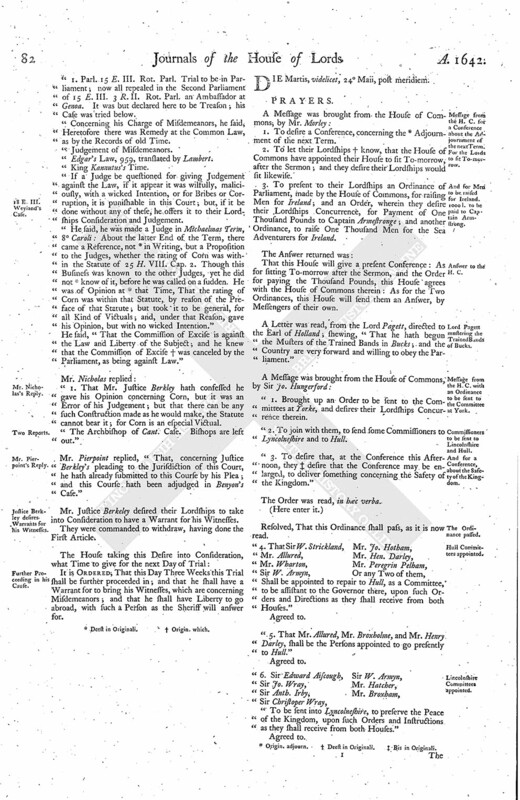 Order to the Committees at York, to publish Votes and Orders of Parliament. Order for 1000 l. to be paid to Captain Armstrong and 27 Officers. Ordered, That Mr. Beauvois, Houshold Chaplain to the Earl of Dorsett, and owned so by his Lordship, being arrested contrary to the Privilege of Parliament, shall be released forthwith. To meet when they please. Ordered, That the Cause of the Earls of Bedford and Portland shall be heard the First Day in Michaelmas Term next, in this House; and that all Witnesses formerly appointed shall attend at the same Time. In the mean (fn. 1) Time, the quiet Possession is to be continued, until it be evicted according to Law. This Day being appointed for the Trial of Justice Berkley, upon the Impeachment of High Treason, and other great Misdemeanors; it was moved, "That a Steward may be appointed, during the Time of this Trial." It is Resolved, upon the Question, That the Lord Privy Seal shall be Steward, for the Trial of Mr. Justice Berkley. To let the House of Commons know, that their Lordships are ready for the Trial of Mr. Justice Berkeley. That the House of Commons will send up some Members of their House, presently, to manage the Evidence against Justice Berkeley. That the Knights, Citizens, and Burgesses of the House of Commons, having, in their own Name, and in the Name of all the Commons of England, accused Mr. Justice Berkeley of High Treason, and other great Misdemeanors, and, in Maintenance of their said Charge, [ (fn. 2) having exhibited] certain Articles against him, to which he hath pleaded, Not guilty in Manner and Form as is alledged; he desired, in the Behalf of the House of Commons and of all the Commons of England, that the said Articles may (fn. 3) be read, and that the Witnesses may be heard, to prove the same. Next, Justice Berkeley's Answer was read, which he made the 26th October, 1641, which was, Not guilty. Then Serjeant Cressold desired, he being One of the Judges in the King's Bench, "That his Oath, which he took when he was made Judge, might be read;" which accordingly was done. Serjeant Cressold proceeded, and opened the Charge, That he endeavoured to subvert the fundamental Laws. The latter Part, that he hath acted it, by Words, Opinions, Actions, and Judgement. 1. Words. In some Cases, Judges are above the Law. That there was a Rule of Law, and a Rule of Government. That was a Way to bring upon the People a Fear of Innovation. 2. For his Opinions, Actions, and Judgement, they are contrary to his Oath, as That he would serve the King and People in the Law. Verba et Acta exteriora indicant interiora. Justice is the Daughter of the Law, and she brings her forth. The Law doth much intrust the Judges: 25 Ed. III. Treason to kill a Judge doing his Office. Then Mr. Nicholas said, "That this general Article is proved by the particular Articles following. Desired to have Leave hereafter to make Use of comparing Articles with another, to prove the Treason. 1. In the King; as by Words spoken in the Eight Articles. 2. In himself and his Fellow Judges, that the Judges in some Case are above the Laws. The Second Article was a Rate set upon Corn, contrary to the Statute 25 H. VIII. and to set up an excessive (fn. 3) Rate upon Corn. Observ. The First Time when this Corn was rated 3° Caroli, when a Commission was voted by the Parliament to be illegal, and brought in and canceled; after the Parliament broke, there was Excises devised, to bring in a Revenue to (fn. 3) the King, and so to keep off Parliaments. This being referred to the Judges, Judge Berkley delivered his Opinion, That Corn was within the Statute. 2. The Consequence and Illegality of it. Never any such Opinion before was delivered: It was directly against the Letter of the Statute. Baron Trevor said, "This Opinion was delivered long ago, upon a Reference to the Judges at Serjeants Inn: That some of the House of Commons desired him to tell them, whether Judge Berkley was of Opinion the prizing of Corn was within the Statute. The greater Number was, That Corn was not; and the lesser Number was, That it was, whereof Judge Berckley was One. Lord Chief Baron deposed, "He doth verily think that Justice Berkley did deliver his Opinion, That it was within the Statute the prizing of Corn. Judge Crawley said, "At the Reference, every Man did deliver his Opinion severally; and Judge Berckley did give his Opinion, That it was within the Statute." Then it was desired, "That, if Judge Berkley had any Answer to give in this Article, that he doth it before the proceeding to another Article. He cannot [ (fn. 4) deny but], in regard of his Errors in the Shipping Business, he hath given the House of Commons great Cause to be offended with him, against which an Act of Parliament hath (fn. 5) passed, to which he submits: But as for Treason, though he stands accused by the Great House of Commons of High Treason, he thanks God he hath a Thousand Witnesses for him, his Conscience, that he is clear from it. Although he wants the Help of Counsel, yet he hopes upon their Lordships Wisdom, Justice, Clemency, and Mercy will be for him, in those Things which come before them. He desired the House of Commons to be pii Inimici, and desired a Trial without Interruption. In February was Twelvemonth, he was accused of the H. C. and then committed in July last. The H. C. in Maintenance of the General exhibited Articles. In October last, he made his Answer thereunto, which he doth still aver. He professed, he would use no Falsehood nor Prevarication for himself. 1. His Witnesses will not stay in Town without a Warrant, which he left to their Lordships Consideration. 2. He offered to their Lordships Consideration the Legality of his Trial. He cited the Statute of Magna Charta. Per Pares. 1 & 2 P. M. 33 H. VIII. to be in the same County where the Treason was committed. A false and peccant Judge is the greatest and devilishest Nusance to a King as can be. The First Statute that punishes Judges is 9 H. III. 12 H. III. 25 Ed. I. 28 E. I. Articuli super Chartas. The Peine of this Statute is, that Three Knights, &c. shall be chosen, assigned under the Great Seal, and sworn to enquire and punish these. 1. Parl. 15 E. III. Rot. Parl. Trial to be in Parliament; now all repealed in the Second Parliament of 15 E. III. 3 R. II. Rot. Parl. an Ambassador at Genoa. It was but declared here to be Treason; his Case was tried below. Concerning his Charge of Misdemeanors, he said, Heretofore there was Remedy at the Common Law, as by the Records of old Time. Edgar's Law, 959, translated by Lambert. 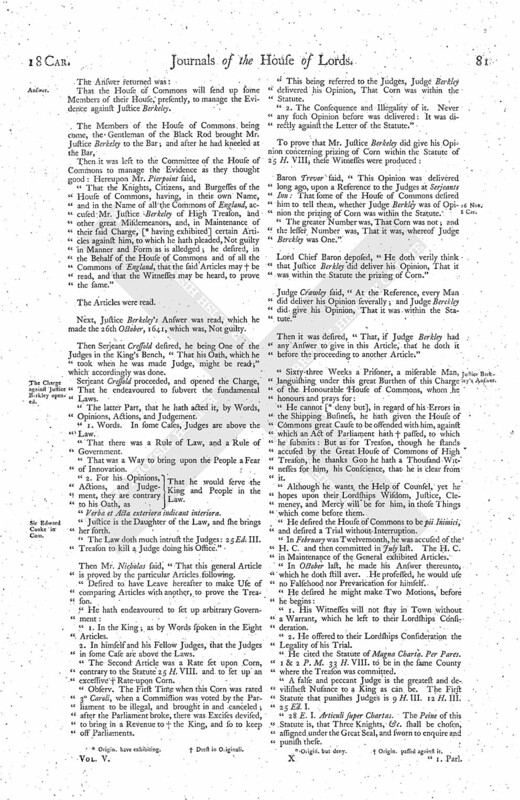 If a Judge be questioned for giving Judgement against the Law, if it appear it was wilfully, maliciously, with a wicked Intention, or for Bribes or Corruption, it is punishable in this Court; but, if it be done without any of these, he offers it to their Lordships Consideration and Judgement. He said, he was made a Judge in Michaelmas Term, 8° Caroli: About the latter End of the Term, there came a Reference, not (fn. 6) in Writing, but a Proposition to the Judges, whether the rating of Corn was within the Statute of 25 H. VIII. Cap. 2. Though this Business was known to the other Judges, yet he did not (fn. 6) know of it, before he was called on a sudden. He was of Opinion at (fn. 6) that Time, That the rating of Corn was within that Statute, by reason of the Preface of that Statute; but took it to be general, for all Kind of Victuals; and, under that Reason, gave his Opinion, but with no wicked Intention." He said, "That the Commission of Excise is against the Law and Liberty of the Subject; and he knew that the Commission of Excise (fn. 7) was canceled by the Parliament, as being against Law." 1. That Mr. Justice Berkley hath confessed he gave his Opinion concerning Corn, but it was an Error of his Judgement; but that there can be any such Construction made as he would make, the Statute cannot bear it; for Corn is an especial Victual. The Archbishop of Cant. Case. Bishops are left out. Mr. Pierpoint replied, "That, concerning Justice Berkley's pleading to the Jurisdiction of this Court, he hath already submitted to this Course by his Plea; and this Course hath been adjudged in Benyon's Case. Mr. Justice Berkeley desired their Lordships to take into Consideration to have a Warrant for his Witnesses. They were commanded to withdraw, having done the First Article. It is Ordered, That this Day Three Weeks this Trial shall be further proceeded in; and that he shall have a Warrant for to bring his Witnesses, which are concerning Misdemeanors; and that he shall have Liberty to go abroad, with such a Person as the Sheriff will answer for. 1. To desire a Conference, concerning the (fn. 8) Adjournment of the next Term. 2. To let their Lordships (fn. 9) know, that the House of Commons have appointed their House to sit To-morrow, after the Sermon; and they desire their Lordships would sit likewise. 3. 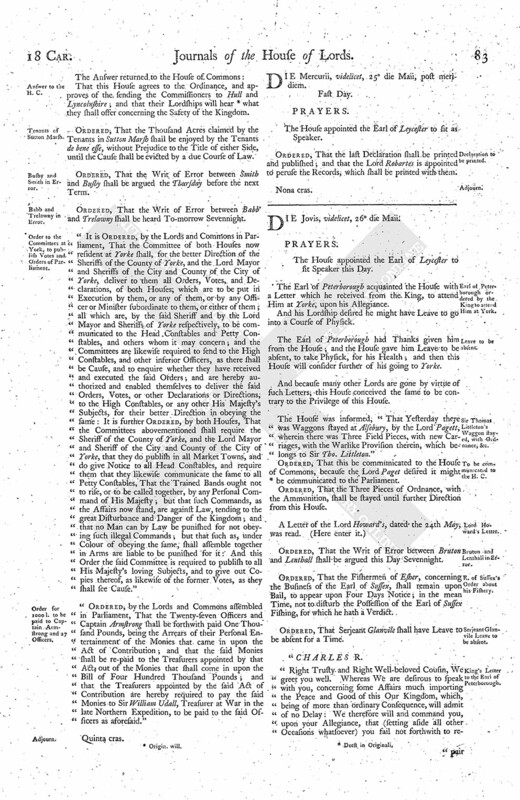 To present to their Lordships an Ordinance of Parliament, made by the House of Commons, for raising Men for Ireland; and an Order, wherein they desire their Lordships Concurrence, for Payment of One Thousand Pounds to Captain Armestronge; and another Ordinance, to raise One Thousand Men for the Sea Adventurers for Ireland. That this House will give a present Conference: As for sitting To-morrow after the Sermon, and the Order for paying the Thousand Pounds, this House agrees with the House of Commons therein: As for the Two Ordinances, this House will send them an Answer, by Messengers of their own. A Letter was read, from the Lord Pagett, directed to the Earl of Holland; shewing, "That he hath begun the Musters of the Trained Bands in Bucks; and the Country are very forward and willing to obey the Parliament. 1. Brought up an Order to be sent to the Committees at Yorke, and desires their Lordships Concurrence therein. 2. To join with them, to send some Commissioners to Lyncolneshire and to Hull. 3. To desire that, at the Conference this Afternoon, they (fn. 10) desire that the Conference may be enlarged, to deliver something concerning the Safety of the Kingdom. The Order was read, in hæc verba. Resolved, That this Ordinance shall pass, as it is now read. Shall be appointed to repair to Hull, as a Committee, to be assistant to the Governor there, upon such Orders and Directions as they shall receive from both Houses. 5. That Mr. Allured, Mr. Broxholme, and Mr. Henry Darley, shall be the Persons appointed to go presently to Hull. To be sent into Lyncolneshire, to preserve the Peace of the Kingdom, upon such Orders and Instructions as they shall receive from both Houses. That this House agrees to the Ordinance, and approves of the sending the Commissioners to Hull and Lyncolnshire; and that their Lordships will hear (fn. 11) what they shall offer concerning the Safety of the Kingdom. Ordered, That the Thousand Acres claimed by the Tenants in Sutton Marsh shall be enjoyed by the Tenants de bene esse, without Prejudice to the Title of either Side, until the Cause shall be evicted by a due Course of Law. Ordered, That the Writ of Error between Smith and Busby shall be argued the Thursday before the next Term. Ordered, That the Writ of Error between Babb and Trelawny shall be heard To-morrow Sevennight. 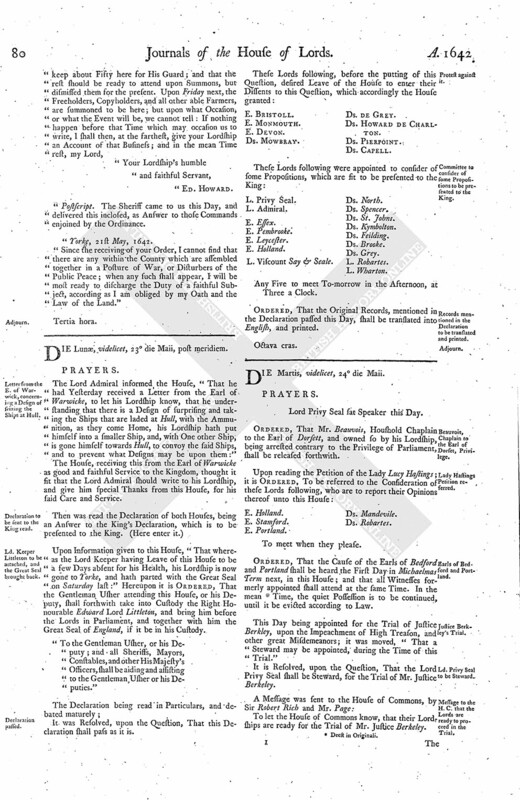 It is Ordered, by the Lords and Commons in Parliament, That the Committee of both Houses now resident at Yorke shall, for the better Direction of the Sheriffs of the County of Yorke, and the Lord Mayor and Sheriffs of the City and County of the City of Yorke, deliver to them all Orders, Votes, and Declarations, of both Houses; which are to be put in Execution by them, or any of them, or by any Officer or Minister subordinate to them, or either of them; all which are, by the said Sheriff and by the Lord Mayor and Sheriffs of Yorke respectively, to be communicated to the Head Constables and Petty Constables, and others whom it may concern; and the Committees are likewise required to send to the High Constables, and other inferior Officers, as there shall be Cause, and to enquire whether they have received and executed the said Orders; and are hereby authorized and enabled themselves to deliver the said Orders, Votes, or other Declarations or Directions, to the High Constables, or any other His Majesty's Subjects, for their better Direction in obeying the same: It is further Ordered, by both Houses, That the Committees abovementioned shall require the Sheriff of the County of Yorke, and the Lord Mayor and Sheriff of the City and County of the City of Yorke, that they do publish in all Market Towns, and do give Notice to all Head Constables, and require them that they likewise communicate the same to all Petty Constables, That the Trained Bands ought not to rise, or to be called together, by any Personal Command of His Majesty; but that such Commands, as the Affairs now stand, are against Law, tending to the great Disturbance and Danger of the Kingdom; and that no Man can by Law be punished for not obeying such illegal Commands; but that such as, under Colour of obeying the same, shall assemble together in Arms are liable to be punished for it: And this Order the said Committee is required to publish to all His Majesty's loving Subjects, and to give out Copies thereof, as likewise of the former Votes, as they shall see Cause. Ordered, by the Lords and Commons assembled in Parliament, That the Twenty-seven Officers and Captain Armstrong shall be forthwith paid One Thousand Pounds, being the Arrears of their Personal Entertainment of the Monies that came in upon the Act of Contribution; and that the said Monies shall be re-paid to the Treasurers appointed by that Act, out of the Monies that shall come in upon the Bill of Four Hundred Thousand Pounds; and that the Treasurers appointed by the said Act of Contribution are hereby required to pay the said Monies to Sir William Udall, Treasurer at War in the late Northern Expedition, to be paid to the said Officers as aforesaid. The House appointed the Earl of Leycester to sit as Speaker. Ordered, That the last Declaration shall be printed and published; and that the Lord Robartes is appointed to peruse the Records, which shall be printed with them. 5. Origin. passed against it.